In 2007, the Municipality of Phnom Penh leased 133 hectares of land in the Boeung Kak Lake areas to Shukaku Inc., a private company owned by ruling Cambodian People’s Party senator Lao Meng Khin, for a period of 99 years. The company planned to develop the land into a high-end residential, commercial, and tourism complex. From that point onwards, the company and the Cambodian government began pressuring residents of the area to relocate, offering deeply inadequate compensation in exchange. On August 26, 2008, the company started pumping sand into the lake, causing residents’ homes to flood and the destruction of some houses. By this time, the government and company had persuaded or coerced more than 3,000 of the 4,000 affected families from the land, despite many of the affected families having strong legal claims to the land under the Land Law. The municipality then issued a final eviction notice in April 2009. 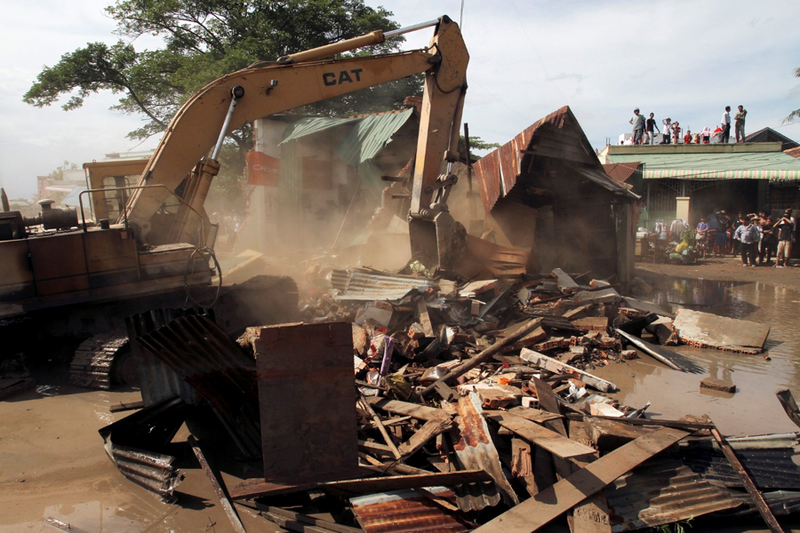 The government along with the company began forcibly evicting the remaining residents. As discussed below, over the course of the last seven years, Cambodian security forces have threatened and harassed current and former residents of Boeung Kak Lake areas in Phnom Penh for campaigning against their forced evictions. Cambodia’s security forces have aggressively denied the right to peaceful assembly by violently breaking up peaceful protests. The authorities have filed trumped-up charges against protesters or would-be protesters. Those charged have been routinely denied bail, convicted after expedited and truncated trials that did not meet international standards and did not give the accused adequate time to prepare and put forward a defense, and given significant prison sentences. The World Bank Inspection Panel later investigated and found that there was a direct link between the Bank-financed $23.4 million Land Management and Administration Project (LMAP) in Cambodia, which was approved in February 2002, and the forced evictions suffered by residents in the Boeung Kak Lake area. Since 2009, Cambodian security forces have carried out a string of arrests of Boeung Kak Lake activists. Initially, police typically released the activists after one or two nights in detention. But since the May 2012 arrests of 15 Boeung Kak Lake residents and former residents, police have charged many detainees from the community with criminal offenses. In several cases, courts have convicted them in trials that do not meet Cambodia’s Code of Criminal Procedure or international fair trial standards. On May 22, 2012, about 80–100 residents of Boeung Kak Lake peacefully gathered, intending to host a press conference as 18 families sought to mark the boundaries of their now demolished homes. Police arrived almost immediately. Police confiscated the residents’ tools and prevented them from demarcating the boundaries of their houses. They were chasing people like they were trying to catch dogs. Some stepped on my friend’s children.… They pushed me in the car and drove away very fast. I couldn’t get up. I wanted to jump even if I died but then I thought of my grandchildren. Read the full article here, originally published in Human Rights Watch report, At Your Own Risk, June 2015.